After having to give up star gazing for a length of time, and my last scope being a Nexstar 6SE, I was looking for a replacement which would be light enough, cheap enough to get back into the hobby and comfortable to use. A bonus would have been a scope that would give me as close a good view of the sky as the 6SE did. WOW. Setup was a doddle. The base fitted together easily and securely and the tube was light enough to be handled by one person. Was I lucky, the first night of ownership was to be a clear sky. Could see with the naked eye that the viewing should be quite good for a modestly priced telescope. Set it up, attached 25mm eye piece, looked in and got the biggest surprise of my life. I have never seen so much through a scope, not even the Nexstar 6SE. There were stars everywhere, I just cannot say how glad I was to purchase the scope, especially as I was only in the shop looking for model paints. Cannot wait until I have got my bearings in the sky again as then I will get to see just how good it is. 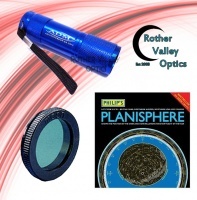 My many thanks to everyone at Rother Valley Optics for their patience and guidance to get me set up again.